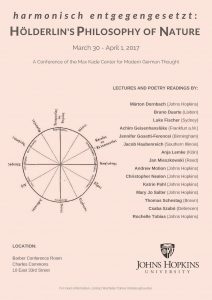 The Max Kade Center for Modern German Thought will hold an international conference, harmonisch entgegengesetzt: Hölderlin’s Philosophy of Nature, from March 30 to April 1 on the relation between Hölderlin’s poetic theory and his concept of nature as developed in his poetry, prose, and dramatic works. The conference is open to the public. Read the conference program for a complete list of sessions and times.